As someone whose been using the Nik Collection for a very long time, I tend not to think very much about which plugins you need. I just sort of know. But then I was recently talking to someone and they reminded me about how confusing the Nik Collection can first appear. That’s why I decided to write this article about how to use the Nik Collection. If you want to know more about using the Nik Collection, I've created a page of Nik Collection tutorials to help. Which of the eight plugins should you use first? And what on earth do all these Nik plugins do? Whilst there isn’t a specific sequence for using the Nik Collection plugins, there are a few recommendations to consider. But before we can get onto those, you need to understand what each of the Nik Collection plugins does. Preparation – includes tasks you should complete before applying adjustments to a photo. Adjustment – adjusting a photo to enhance it, correct it or apply special effects. Finishing – adjustments you apply specifically to prepare a photo for publishing. As you can see, these are stages in a photo editing workflow. The other important point to understand when using the Nik Collection is that they only work with JPEG and TIFF files. This means that if you’re working with RAW files, you will need to convert these to an image using a RAW converter. Only then can you start to work on the image with the Nik Collection. Let’s consider the best category for each of the plugins in the Nik Collection, as well as understand what they do. Dfine 2 – Removal of image noise from photos. Typically, you apply this early in the processing before other adjustments have exaggerated the noise, making it more difficult to remove. It is possible you might apply further noise reduction, but selectively, as part of the Image Finishing stage. Sharpener Pro 3: RAW Presharpener – This is one part of the Sharpener Pro plugin. It’s intended for sharpening images shot as RAW files, to counter the softening effect of the capture process. Analog Efex Pro 2 – Applies special effects to a photo which are reminiscent of film photography. But these don’t replicate a specific film types but rather the imperfections associated with film cameras. For example, fading, scratches, light leaks etc that you might see when looking at old photos. Color Efex Pro 4 – This plugin contains a wide selection of filters covering a range of activities. Some will help you enhance or correct photos (and allow you to maintain a realistic photo). Others add special effects to photos, for example simulating a polaroid film effect. HDR Efex Pro – This plugin has two functions. 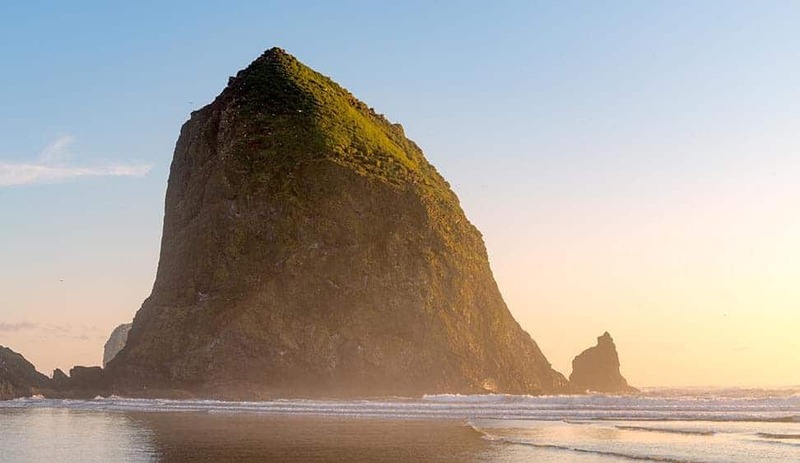 The first is to combine multiple photos with different exposures into a single HDR image; there is an argument you could consider this Image Preparation. The other function is to apply tone mapping to HDR images. Silver Efex Pro 2 – Converts photos to monochrome. It includes adjustments that allow you to maximise the appeal of the converted image. Also, you can apply special effects that are typical of black and white film like film grain. Viveza 2 – Adjusting the tones in a photo (how light or dark an area appears) as well as the colours. Sharpener Pro 3: Output Sharpener – This is the other part of the Sharpener Pro plugin. It’s applied to images as a final step to prepare them for output either to a screen or in print. When it comes to deciding the order to use the Nik Collection plugins, the following diagram should help you. Notice the illustration shows the three categories we discussed about earlier. Image Preparation, Image Adjustment and Image Finishing. You will also notice the Image Adjustment stage is in two. On one side you have Image Adjustment for colour images whilst on the other we have black and white image processing. If you look at each stage, you can see the suggested Nik Collection plugins to use in that stage. You’ll also see a number to the left of each. This indicates a possible order in which you would use the plugin. 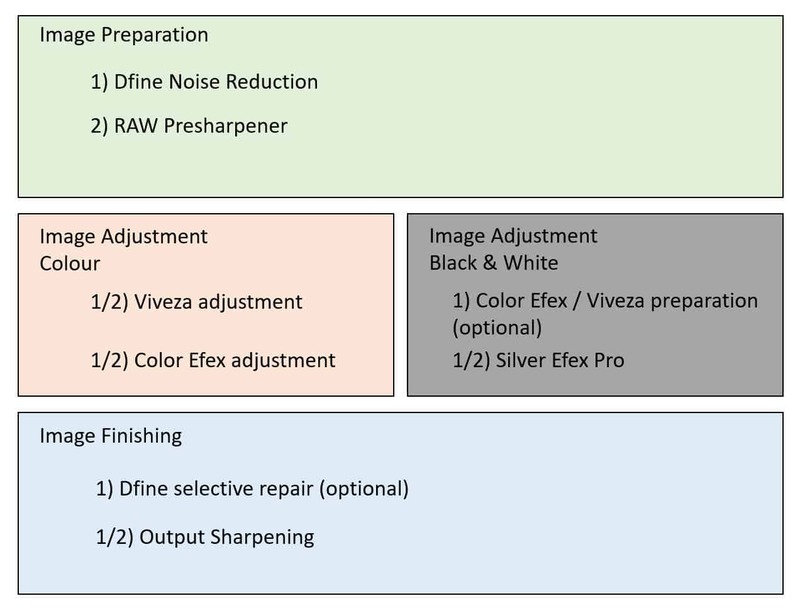 For example, for Image Preparation you would use Dfine noise reduction before applying Sharpener Pro RAW Presharpener. That’s because it’s more difficult to remove noise cleanly once you sharpen the image. In some of the stages you will see the numbers aren’t in sequence, for example “1/2) Viveza adjustment”. This indicates you can apply any Viveza adjustments either first or second. If you look at the “Image Adjustment Colour” section, you will see both Viveza and Color Efex Pro have this number. It’s indicating you can use either in any order you like. Using this graphic, you should be able to navigate your way to a good workflow for processing both colour and black and white photos using the Nik Collection. There are a couple of exceptions not covered by the diagram that we need to deal with. These are Nik Analog Efex and Nik HDR Efex. In the case of these plugins, you would use them in the Image Adjustment stage of editing. Typically, you would apply one of these plugins before continuing to the Image Finishing stage. Nik HDR Efex may be an exception though. There are times when it’s hard to achieve the look you want, only using the tools in HDR Efex. The first example is if your HDR image is going to be a colour photo. Don’t be afraid to take it into Viveza and/or Color Efex to refine the colours and apply further adjustments. The other is to use HDR Efex to pre-process a photo before converting it to black and white. This can help create a very effective black and white conversion and something I covered in this Youtube video. The best advice I can give is not to worry too much about the order you apply the Nik Collection plugins to your photos. The order you use the plugins can be important but it’s not critical. If you follow the workflow suggested in this tutorial you will be on safe ground when it comes to using the Nik Collection tools. I have been using Google Nik Collection for some years now in a workflow starting with Capture NX-D to CS5 including Nik filters. Now I have Affinity Photo with a raw development which I find good enough and which does not require to pass via TIFFs. However, Viveza is unusable from Affinity Photo due to strange colour shifts. Silver Efex an Color Efex work well to the exception that after returning to Affinity Photo when I finished in Color Efex, the result looks more pronounced than it did with the final filter in Color Efex. Do you have any experience or advice regarding Affinity Photo and Nik Collection? Yes, I covered this in the following post. I also included a video explaining a couple of problems and how you might work around them. No problem. I can relate to that. I have a question about your reference to your statement that the Nik Collection only works with JPG or Tiff files. I have been using the Nik Collection for some time. Here is my work flow. I convert the Nikpn nef files to dng files. I open the dng files in Photoshop camera raw and make a few adjustments. I then save the edited dng file as a dng file in another folder which I call Edited dng. I then open the Edited dng file in camera raw and immediately “Open the Image” which opens the image in Photoshop. When I am done I save the file as a PSD master. While you may argue that my workflow is not streamlined it seems to work for me. No where in the workflow have I created a Tiff file, hence my question. Can you explain your comment about JPG and TIFF in the context of my workflow. Good question but I’ll stand by what I said. You can’t edit a RAW file in the Nik Collection and the only image formats Nik will work in are JPEG and TIFF. What happens when you use the Nik as a pluin for Photoshop is that Photoshop is passing converted image data. It isn’t passing the RAW data. There’s a common misconception closely related to this which is using the Camera RAW filter in the Photoshop Filter menu reopens and edits the RAW file (which it doesn’t). There are some clever things that go on in the background in Photoshop but ultimately the RAW file is converted into an “internal” image which can be manipulated. Hope this makes sense. 1. Should I change my workflow. 2. Am I compromising my images in any way? 3. Can I keep working as I have been? If your current approach works for you then you can can carry on with that approach. Yes it’s possible you may be compromising image quality but how much would depend on your current approach. A good idea would be to process a few same images using you current approach and then process them a second time using the approach in the article. If you don’t see too much difference then your current approach is fine. I’m not “secure” with Viveza, but use it sparingly w/ control points to lighten or darken areas that are, um, “out of harmony?” with the “totality” of the photo. Hope to develop my Viveza skills– have your book on the subject, so it’s been my laziness to just ‘push through’ with examples provide. again, thanks, for your generosity in sharing this. regards, P.
Thanks Pablo. Hopefully you will develop your love of Viveza. I think I use it the most of all the Nik Collection. That is a an excellent overview Robin, thank you. It does put the software suite into a perspective that, whilst instinct might tell me some of that workflow, your experience gives me a confidence and food for thought. I’ve cut your diagram out to keep handy! Technical question about TIFFs. Extending the workflow back a bit, for LR Classic users anyway, I export my DNGs to a Nik filter as a TIFF, usually with some LR adjustments. Am I right in making some basic exposure / light dark recovery tweaks / corrections in the raw file before exporting? That a TIFF from a Raw file might not recover some needed information? Yes, do make adjustments to the image in the RAW converter. Try to correct colour and tones before taking it into the Nik Collection. If you also decide to use the RAW converter noise reduction and sharpening you can skip using RAW Presharpener and Dfine. I hope that makes sense. This is a very important clarification. It clears up a lot ! Thank you. It’s great to know it’s helped you. Thanks Robin, yes it makes sense. I’m liking Nik software so far and look forward to following up your tutorials as time allows. Cheers. Can you please in some detail when and how to use RAW Presharpener sinceyou cannot apply it directly to a RAW filr? Personally, I rarely use the RAW Presharpener. I tend to apply capture sharpening as part of the RAW conversion process. Have you seen the RAW Presharpener video I posted on YouTube though?